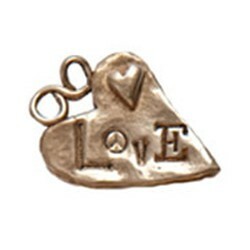 "Bronze Lots of Love Charm, Pendant"
This unique bronze charm is large enough to use as a stand alone pendant. While this is our largest charm, it will still work on a charm bracelet or necklace. The Lots of Love Charm is our largest and will make a great focal piece. This bronze charm will make a great pendant on a necklace or addition to a charm bracelet. The charm is approximately 1 1/8" x 7/8".